One of the top bike parks around the Tahoe area, the Bijou Bike Park, in South Lake Tahoe will soon receive a new donated addition, due to the work of a senior at Sierra Nevada College and a crew of workers from Healthy Home Consultants. Recently, Weston Park and the workers from Healthy Home Consultants have been putting in hours of work during their downtime to erect a new concession stand at the park, which will be used during races and by park volunteers. While working on backflips at the bike park on Tuesday, Oct. 24, Jonah Teetsel, who said he’s been practicing at Bijou over the past few months, said the shed will add more value to an already great place to ride. 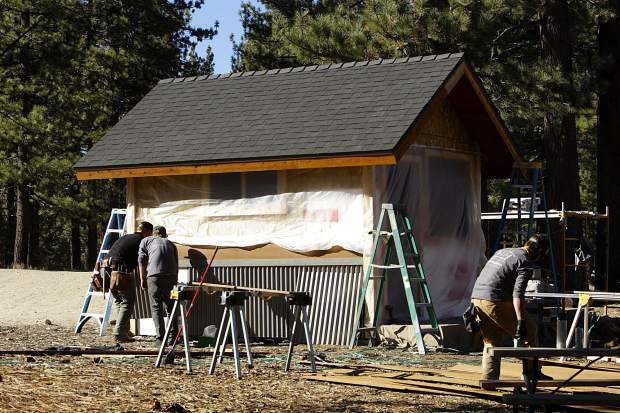 The shed’s construction is part of Park’s senior project at Incline Village’s Sierra Nevada College as a sustainability major, and will be a donation to the bike park. Through one of his counselors at Sierra Nevada College, Park was able to reach out to Healthy Home Consultant’s owner Bret Hackett, and together they have laid the foundation for a new company — Tahoe Shed. Healthy Home Consultants is a green building, and sustainable design firm, according to its website, and is located in South Lake Tahoe. The 10 feet by 12 feet shed that is being constructed at Bijou Bike Park is typical of what the company will provide. The dimensions are the largest California allows without obtaining a building permit, said Park, and the shed only takes a handful of days to erect. The crew was adding corrugated metal siding to the shed at Bijou Park on Tuesday, Oct. 24, and will put the final touches on the project later in the week. Park said he plans to reach a point of efficiency in the process where sheds are prefabricated and are erected in day or two. Quality is what separates Tahoe Shed from other mass-manufactured structures, according to Park, with sheds that are built to last over the years, endure Tahoe’s heavy winters, and blend into the natural surroundings. Park said the project at Bijou Bike Park has already garnered the attention of potential customers, and that he’s working on his business plan next semester and will graduate in the spring. At this point, Tahoe Shed is just getting underway with customer purchases of sheds. For more information email westonpark0@gmail.com or call (805) 210-1996.